Indiana Jones and the Kingdom of the Crystal Skull hits theaters May 22, but that doesn’t mean you have to wait to buddy up to Dr. Jones. 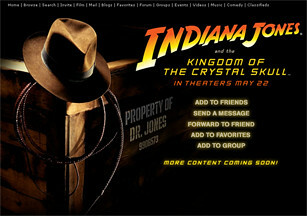 Now for you social networking kids, Indiana Jones is officially on Myspace. So be sure to friend him now before Short Round makes it to his Top 10 Friends List. Check out the official Indiana Jones profile on Myspace here. This entry was posted on Thursday, November 1st, 2007 at 3:28 pm and is filed under Indiana Jones IV, New Indiana Jones. You can follow any responses to this entry through the RSS 2.0 feed. Responses are currently closed, but you can trackback from your own site.